…Pick and shovels were used for mining in Weat Brother Island as graphite was flaky. Blasting was only used when strong hard rocks were encountered. 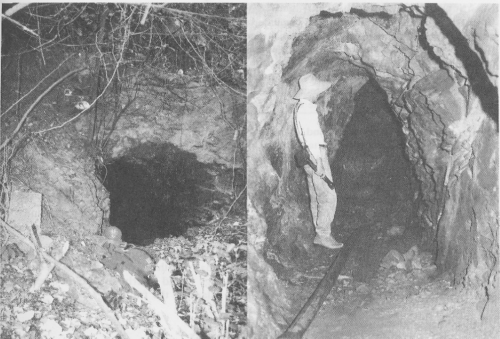 Underhand stoping, in which the ore was mined from below the accessing level, was used for the underground excavation. Mined ores were hoisted up with baskets and sent to the drying grounds on the surface. The former graphite mine on West Brother Island operated from 1952 to 1971, producing high quality graphite for export to the United States and Britain. Following the closure of the mine, the island was subsequently levelled as part of the construction of the new Hong Kong International Airport at Chek Lap Kok. This article traces the history of the mine and corrects some misconceptions that have developed over the years. 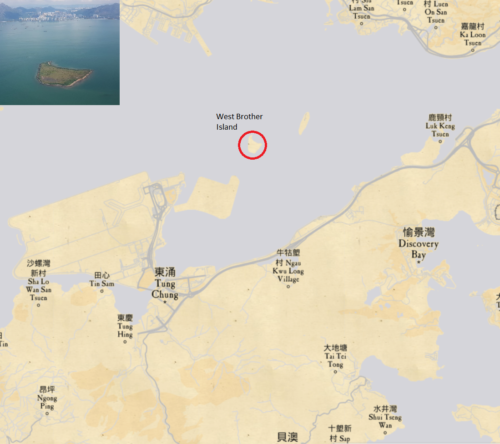 West Brother Island or Tai Mo To Island forms one half of the Brother Islands or Mo To Chau, located to the east of the Hong Kong International Airport. The West and East Brother or Siu Mo To are located on the northern approach to the airport and you can often see the islands when landing or taking off. 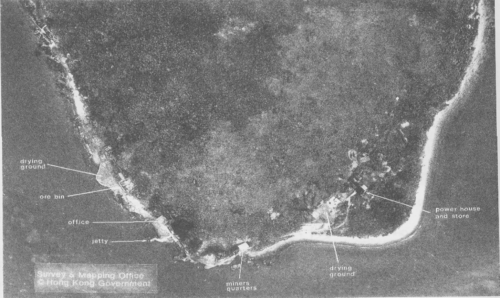 The islands had original elevations of 68mPD and 63mPD before they were both levelled to avoid affecting the aviation traffic of the airport. West Brother is now home to a helipad and small weather station. Graphite is a native form of carbon, crystalline and with high thermal stability properties. Its primary use is in high temperature and high pressure environments, along with forming the lead for pencils! 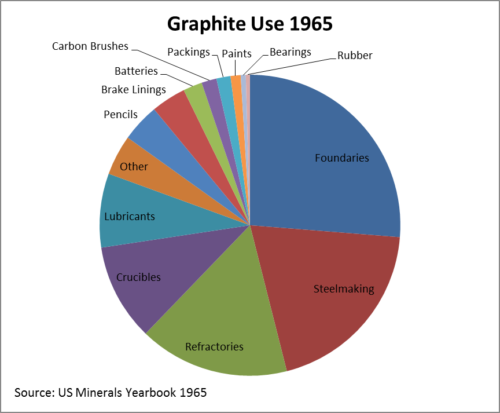 In the 1960s the main use of graphite was in heavy industry, providing containment and additives needed to make modern steels and components. The main export markets were the US and the United Kingdom. In a 1956 article in the South China Morning Post, a visiting United Kingdom Trade Commissioner, Mr G. B. W. Harrison noted that graphite was also used as a moderator in the nuclear industry. However, he did note that he did not know if the Hong Kong graphite was used for atomic purposes. If he had done his homework or had access to Wikipedia(! ), he would have known that the nuclear industry used nuclear graphite, a synthetic graphic specially manufactured from coal-based binder pitch to remove all in-purities. 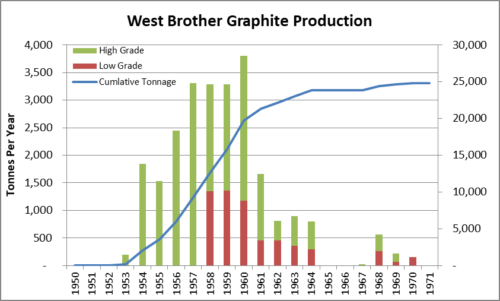 The graphite from West Brother would not have been suitable for use in the nuclear industry. This story may be true but the dates are not correct. 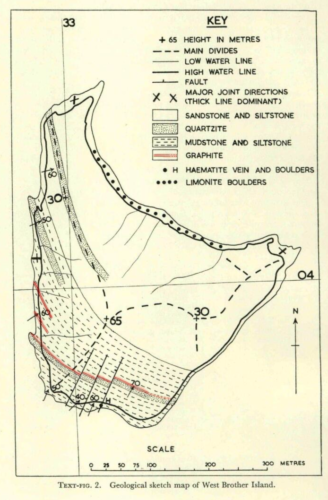 The 1957 paper by Ruxton Graphite Seams in Hong Kong, reports that the occurrence of graphite on West Brother was first recorded in 1923 by Dr C M Heanley, “there are regularly bedded graphites like old coalseams at the south-west corner of the West Brother”, but the importance of this was not realised until the early 1950s. 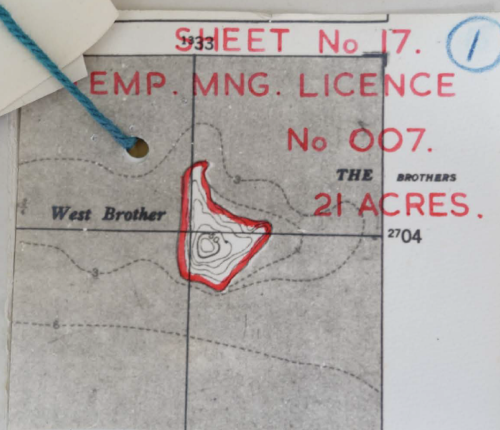 It may have been the discovery by the fisherman, or it may have been the spike in graphite prices in 1950 but in 1951, the District Office received multiple applications within a few months of each other to commence mining on the island. On the 16th August, 1951 Mr Tang Hon Fung and four others applied for a mining licence to extract graphite on West Brother. They had previously submitting individual applications but were encouraged to submit a joint proposal. The five gentlemen were: Tang Hon Fung of Tsing Yi, Chan Yut San of Castle Peak, Tang Tak Yuk of Yuen Long, Chow Tai Hing of Yuen Long and Ma Sing Chak of Kowloon Tong. Originally, there was a sixth applicant but it was found that he had been convicted of a mining offence and was dropped from the joint application. By the end of 1951, they formed the Ng Fuk Black Lead Mining Company with a capital HK$100,000 and were ready to commence operation. A note in the application recommendation of the 16th January, 1952, stated “There is considerable illicit activity going on at the present time on this claim”. Others had already started to mine the mineral. Temporary mining licence no. 007 was approved by the Executive Council on the 19th February, 1952 and granted to the Ng Fuk Black Lead Mining Company for a term of six months. However, the licence was not issued until the 29th July 1952 as the company had not been registered at the time of the original approval. The licence continued to be extended every six months during the operation of the mine. Mutual Trust Co. on the 10th September, 1951. All these applications were declined on the grounds that a recommendation for the mining licence had been made by the District Commissioner to the Executive Council. According to an article in the Far East Economic Review by B. P. Ruxton in 1955, the island consists of sandstone and siltstone to the north and baked mudstones and shales to the south west. Within the mudstone a series of graphite bands dipping at around 60 degrees to the north-north-east. The graphite bands were reported to vary in thickness from 300mm to 3m, with an average of about 1m and is said to be over 300m deep. The dry analysis indicated the graphite content was between 60% to 92% with an average of 80%. The mine was worked by hand, the graphite being extracted using picks and chisels. Blasting was only used to remove the native bedrock to widen tunnels and when encountering fault offsets. The mineral was placed into baskets and carried by hand to the surface where it was tipped down a small wooden chute into a storage shed. It was then left to stand in heaps for a few weeks to dry out, before being placed in 100kg double sacks for export. A small wooden jetty was constructed to allow the sacks of graphite to be loaded into small boats for delivery to the buyer. 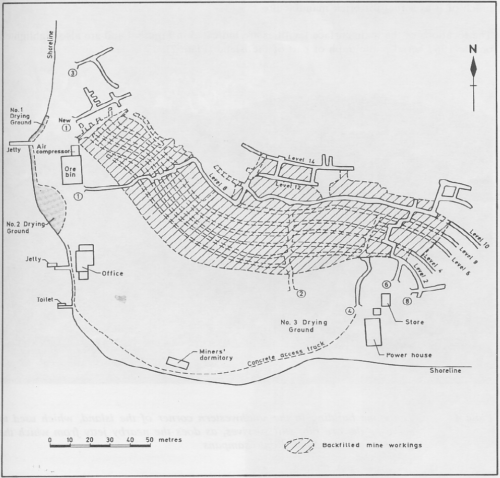 In a 1957 Ruxton paper, he describes the mine as interlaced of tunnels and shafts, and that “Candles burning at frequent intervals along each tunnel provide illumination and prove the adequacy of the oxygen supply”. The mine followed the main seam 150m across the island and excavated down to 10m below sea-level. Pumps were installed in the mine to remove 9m3 to 18m3 of fresh water from the lowest tunnel each day. This ingress increased as the mine excavation got deeper. The mine continued to be developed, producing around 300 tonnes of graphite a month, following the seam down and to the north, ultimately reaching around 90m below sea level. Continuous pumping of the ingress water was required and flooding was not uncommon. The SCMP reported that the mined flooded in June 1959 following exceptionally heavy rain, and that the same rainstorm had resulted in a large land slide at Ma On Shan and forcing mining operations underground. Ventilation was also a problem as the mine developed. Along with electric pumps, electric hoists, electric lighting, electric compressors were introduced to provided fresh air to the lower levels. Excavation of the graphite was undertaken using the underhand stoping technique. This required the mineral to be excavated from the top to the bottom, digging out the floor of each level with the ore collected and taken out to the surface. Once a particular section was exhausted, the void was backfilled with waste rock. This avoided the need to remove the waste material from the tunnels and provided stability to the working. Timber shoring was also provided in all sections of the mine to minimise rock falls. Many reports refer to the Tin Bo Mining Development Corporation, including a 1954 article in the SCMP. This company was most likely the contract miner for the mine working for the licensee Ng Fuk Black Lead Mining Company. It was a common practice for an owner to contract out part or all of the mine operations. Around 30 workers lived on the island in small huts located on a small wave cut platform on the edge of the island. Their food, water and supplies were transported by small boats to the island from Castle Peak. The quality of daily output from the mine varied and analysis of the carbon content was made from samples of each days output from each tunnel. The carbon content was generally high at around 80% but where the mineral include contaminates of graphite shale, the carbon content dropped to around 50%. The high quality ore was exported to the UK, United States, Netherlands, Taiwan and Japan while the low grade graphite was sold locally for paints and pigments and protecting against the corroding effects of smoke, gases, acids and alkalis. During the 1960s the price of graphite dropped and production at the mine was reduced to minimise costs. However, with the electrical machinery, the operating cost of the mine increased while the quality of the graphite remained mixed. Operation of the mine ceased in 1971 and the mine formally closed in 1973 when the mining licence expired. Following the closure of the mine, the site was abandoned, visited only by adventurers and interested parties. 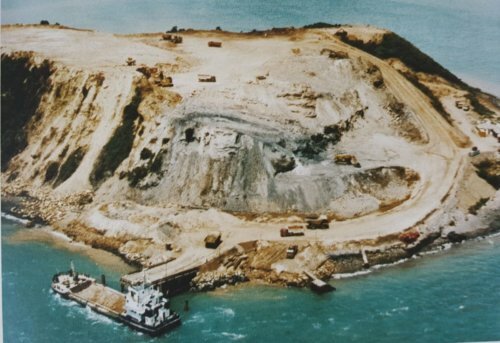 In March, 1993 as part of the new airport project, both the East and West Brother islands were levelled so as to avoid creating an aviation hazard. A temporary landing ramp was constructed and the heavy construction plant landed. The two islands were blasted into fragments and the islands generated 5.3 million m3 of rock for the new airport reclamation. What was left of the mine workings were destroyed in the process. During the 1960s it became possible to produce synthetic graphite commercially and this now competes with natural graphite in the world market. 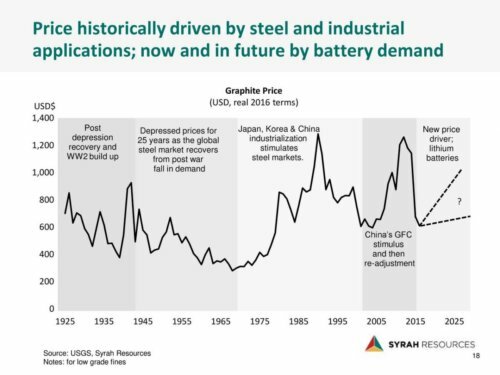 The world-wide demand for graphite and associated price peaked in the early 1990s and again in 2014. The industry hopes that with the growing demand for lithium batteries, the price will once more reach new heights. Who knows, if not for the new airport, the West Brother mine might have made a come back! This article was first posted on 21st October 2017.